The Battery Operated Go Kart is an impressive toy sure to delight children. 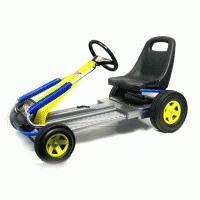 This bright yellow and blue Go-Kart offers many features that will keep kids focused and entertained for hours, as they drive all over the neighborhood. An easy press of the sleek pedals and a slight turn of the wheel makes this kart a dream to drive. Ages 3-6.